One of the reasons I enjoy studying history is that it gives me an opportunity to learn about extraordinary people — people as varied in their achievements as Joan of Arc, George Washington, Ludwig van Beethoven, Vincent Van Gogh, Albert Einstein, and Nadia Boulanger. It might sound odd, but my interest in Billy the Kid is on par with the people listed above. I’m saying the Kid was an admirable character or that he necessarily achieved anything good in this world. All I'm saying is that I find his story is endlessly fascinating. In many ways, the Kid seems an unlikely character to catch my attention. In all likelihood, he was nothing more than a punk, a young man who settled his problems through violence. For someone like me — someone who abhors violence — the Kid is, to say the least, an unusual obsession. But, oh, what a great story the Kid gave us! Without providing all the details, let me outline the traditional tale told about the Kid. Keep in mind that I’m not providing the real story of the Kid's life, just the traditional story that surrounds the myth. The Kid was born in New York in 1859, and after the Civil War his widowed mother took him west. His mother then raised him and his brother on her own while running her own businesses in Indiana, Kansas, and New Mexico. The Kid was orphaned at the age of fourteen in Silver City, New Mexico Territory, and then forced to survive in a lawless society populated by the often-violent migrants of the frontier. He got into trouble in Silver City, escaped from jail, and went to Arizona. The Kid became a horse thief and cattle rustler in Arizona, and after killing a man — probably in self defense — he joined a gang of ruthless outlaws in New Mexico. After moving to Lincoln County in eastern New Mexico Territory, the Kid was given an opportunity to make an honest living when an Englishman named John Tunstall gave him a job as a ranch hand. The Kid worked for Tunstall only a few months before Tunstall was assassinated by men working for The House, a business organization that had monopolized Lincoln County. The Kid was then thrust into a war against The House, as well as a group of ruthless businessmen and politicians running the entire New Mexico Territory, a group known as the Santa Fe Ring. After the Lincoln County war ended, the Kid kept fighting against The House and those who were in cahoots with the Santa Fe Ring. He chose not to leave New Mexico Territory and made himself a nuisance by rustling livestock from his enemies. In an attempt to put his life on the right side of the law, the Kid made a deal with the Governor of New Mexico. He agreed to testify in open court against allies of The House. In return, the governor offered him a pardon for crimes he had committed during the Lincoln County War. Although the Kid kept his part of the bargain and testified, the governor never gave him his pardon. The Kid also tried to get on the right side of the law when he played a leading role in calling a truce between the opposing sides in the Lincoln County War. The truce didn't last long when it was violated by men who worked for The House. The Santa Fe Ring, probably trying to turn attention away from their own crimes, began using newspapers to portray the Kid as the worst of the worst in the New Mexico Territory. After being made a scapegoat for the violence in Lincoln County, the Kid became a symbol for the lawlessness of the American West. Captured and sentenced to hang, the Kid became the only person convicted of a crime for actions committed during the Lincoln County War. In a daring and bloody escape in which he killed two guards, the Kid fled his Lincoln County jail only a few days before his execution. Unwilling to leave New Mexico Territory, the Kid found refuge among those who supported him near Fort Sumner. After walking into a dark room at midnight, the Kid was ambushed and shot dead by Sheriff Pat Garrett. What a story! The arc of the Kid's life has the makings of a timeless myth, and I suspect historians, novelists, and filmmakers will be reshaping the Kid’s legend for generations to come. And why the Kid? Why do so many people, me included, find his story so compelling? First, I would point out that although the Kid may have been an outlaw, he was an uncommon one. He loved music and dancing. He liked to sing, and by many accounts he liked to read. In the heat of battle, he was said to be daring, brave, and loyal. He was intelligent and charismatic. In short, he was the type of historical character who makes a good story. Second, his life provides us with a mythic tale that can be told in a variety of ways to meet a variety of needs. So little is known for certain about the Kid's life that it is often difficult to separate fact from fiction when hearing his story. From questions about the date and place of his birth to the controversies surrounding his death, people can take his story almost anywhere they want it to go. He can be portrayed as a black-hearted villain or the American Robin Hood. His story works both ways. Finally, the Kid’s story is timeless because he will remain forever young. Dead at age twenty-one, the Kid never had a chance to grow old and look back on the recklessness of his youth. We must also think about how an untimely death can place an exclamation point at the end of someone's life and make that person a legend. Just think about how premature deaths helped turn the following people into icons: Joan of Arc, Abraham Lincoln, Huey Long, James Dean, John Kennedy, Malcolm X, Martin Luther King, Robert Kennedy, Harvey Milk, John Lennon, Kurt Cobain, and Tupac Shakur. Billy the Kid can certainly be placed on that list. 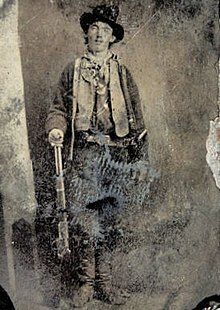 I am often asked about the reasons I am so interested in Billy the Kid. My answer, in part, stems from the fact that I have lived my entire life in southern New Mexico, and Billy the Kid is part of my cultural DNA. I also spent thirty years as a high school teacher and taught many students who reminded me of the Kid. I taught students who were intelligent and charismatic but nevertheless headed the wrong way in life. Something traumatic may have happened to them at a vulnerable age that changed them forever. Their stories, as well as the Kid’s, are timeless. All told, I really have only one answer to the question about what got me so interested in the Kid: Who wouldn’t be interested in Billy the Kid?